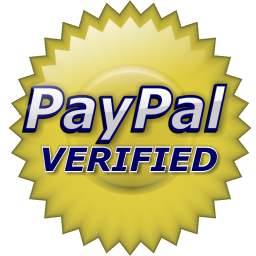 PAE RO Metal Pressurized Tanks are cost effective, reliable, and NSF certified under standard 58 and CE approved under the PED (pressure equipment directive) for drinking water usage. 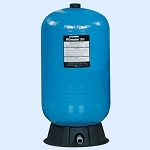 For reverse osmosis (ro) systems, these pressurized tanks are used as a water reservoir. Water is filtered through a reverse osmosis membrane very slowly and people don't have the patience to wait a long time to get a glass of water. 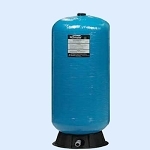 For this reason the residential RO units need a water storage tank to store the purified water. 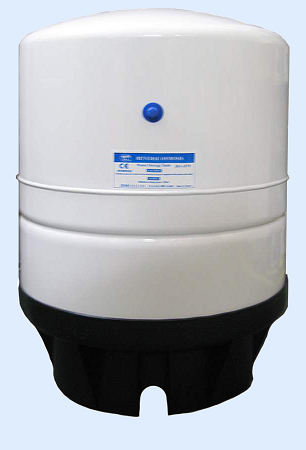 The RO tanks can deliver stable and constant water flow when the faucet is opened. Pre-pressurized bladder tanks. Pressured bladder tanks have several advantages over atmospheric tanks. Pressurized tanks do not require any delivery pump and are less likely to have microbial contamination versus atmospheric tanks. 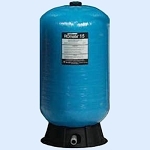 PAE pressure tanks use a butyl diaphragm and polypropylene liner to separate the water and air. These materials limit the growth of germs and prevent impurities inside the tank to provide the best tasting drinking water available. To avoid odor from the tank diaphragm, the tank diaphragms are post-cured prior to the complete assembly of the tank... PAE tanks come pre-charged with pressure and very little to no adjustment is necessary prior to installation. 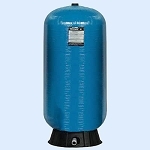 These tanks come with a steel exterior for better pressurization when compared to plastic storage tanks. Metal tanks are more rigid and firm against the interior pressure and tend to maintain the true pressure while plastic tanks tend to bend and conform.